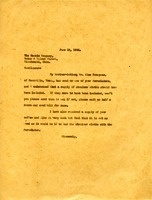 Martha Berry writes to Dr. Myers in regard to her nephew, Alex Bonnyman, who failed several of his classes at Princeton. She says that his father wants him to be an engineer, but that's not what's best for him. She says that she's written to Dr. Hibben to ask him to give Alex a second chance. She asks for Dr. Myers' advice and encloses the copy of the letter written to Dean Misenhart. 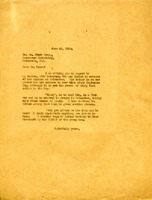 This is a letter from Martha Berry about her nephew Alex Bonnyman. He is studying engineering at Princeton and failed his second term, prohibiting him from advancing to the junior class. Martha Berry is asking if her nephew can change branches of study. 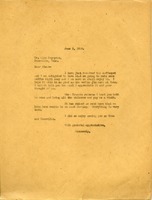 Letter to The Heekin Company form Martha Berry concerning a Percolator that her brother-in-law Alex Bonnyman sent her. She asks for straining cloths to be sent to her. 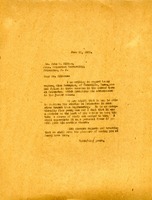 Martha writes Mr. Bonneyman to tell him that she has recieved and sure she will enjoy it. Martha also tells him that when Frances returns she wants a visit from both of them and the children.